The REF Open Access Planning workshop, which took place in Manchester in December 2015, was oversubscribed. This was quite disappointing for many of us who were in the process of setting up workflows in preparation for April 2016 and were keen to attend. Our open access team here at Surrey was therefore delighted to receive a visit from Dominic Tate, Scholarly Communications Manager at the University of Edinburgh and project manager of Lessons in Open Access Compliance for Higher Education (LOCH), to offer advice and start a dialogue on open access and the REF. The visit took place in January, when we were still shaping our implementation plans. Different models work for different Universities; but while there is no one-size fits all solution, exchanging ideas with others is always beneficial. Dominic put us in touch with nearby institutions with this in mind. It is important to keep the model simple. A ‘devolved’ or ‘centralised’ model – or a combination of both, can be chosen to fit the institution’s size, culture, and existing practices. Here at Surrey we are combining both approaches, identifying champions at School or research group level to help spread the messages, but also supporting a ‘top-down’ approach, e.g. emails from senior members of staff. It is important to create a really clear understanding of what is meant by ‘on acceptance’ and provide succinct guidance regarding this. It is difficult to evaluate the FTE needed to work on Open Access if it is not yet fully embedded or adopted in the institution. 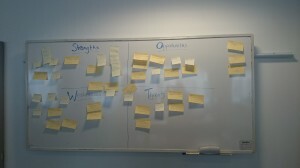 Thinking about what tasks need extra resource is essential. We took this advice to put forward a business proposal for a specific workflow that we believed would work best for Surrey. It is worth considering the relatively low cost of Green OA in making a case for funding: this is approximately £33 to deposit a manuscript compared to £88 to pay an invoice – plus the invoice cost of approx. £1750 (based on SPARC figures). \this, too, has been very informative when putting forward a business case. Having an open access policy in place, which Surrey has had for many years now, is only the first step towards implementation. A clear operational plan is necessary to implement the policy. In this respect Surrey has made a lot of progress, but this now needs to be aligned with HEFCE priorities. We need to start thinking about open access as part of the research lifecycle. If, for example, we treat open access like we treat research ethics, then it will become much harder for researchers to ignore. The emphasis should be on the added value of OA, rather than on compliance. Make sure that key ideas around the value of open access are not lost among funders’ mandates, supporting systems and copyright jargon. Surrey has been supporting open access since the setup of our first repository in 2005. GFollowing the introduction of HEFCE’s open access policy we have reviewed our practices, moving to more mediated procedures, and strengthened the messages with compliance in mind. Discussing this within the LOCH project context has helped us see more clearly what others have tried and what is most likely to work for our institution. Even more importantly, we have also addressed support of open access beyond compliance with HEFCE. Yesterday saw the LOCH and End-to-End projects host a joint event at Glasgow’s Hilton Grosvenor Hotel to look at technical issues related to Open Access policcy compliance for the REF. The morning session consisted of a series of short ‘show-and-tell’ sessions whereby participants generously gave up their time to demonstrate how the repository and research information systems they use can support the new requirements, which came into play on Friday. After lunch, delegates joined groups looking at technical issues in PURE and DSpace. Another group discussed some of the non-technical issues to do with REF policy and OA funding and spent time sharing experiences and best practice. The day was rounded off with presentations about CASRAI, SHERPA-REF and Jisc Publications Router. The organisers are in the process of writing up a more thorough report, to be published on the LOCH and End-to-End blogs in the next few days. How do we slice our LOAF (Library OA Fund)? A number of Universities have introduced funding to support Open Access publishing in addition to external block grants. We are often asked about the rationale for our OA fund, so we have produced a short report as part of the OA Good Practice LOCH Pathfinder Project. This short report describes the case for a small institutional fund to support open access publishing at the University of St Andrews. The background to the fund is an institutional commitment to ensuring the widest possible access to its research, and a belief that researchers should be free to choose the most suitable venue for their work. If an author decides that a fully open access journal is the best venue for their work, we do not want there to be any barriers to publishing. The University Library therefore proposed a model where researchers could apply for funds specifically when they wish to publish in a journal which is only available in open access form and which requires payment of a publishing fee. The report describes how the fund operates, and its ultimate aim to encourage and support a transition to open access that is sustainable and achievable. This morning the University of Edinburgh’s Scholarly Communications Team was delighted to receive a delegation of guests who have travelled all the way from Osaka University in Japan. Xin Yao and Tomoko Ohya are based in the University’s Support Office for Large-Scale Education and Research Projects. They were joined by Shotaro Hidaka who is Osaka University Library’s Serials & Electronic Resources Librarian, and Mami Yamamoto from the Finance Office. The morning kicked off with an introduction from our Director of Library & University Collections, Jeremy Upton. 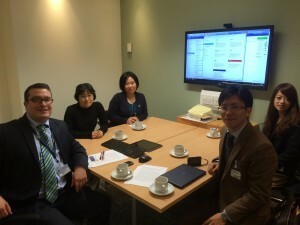 After this, Head of Research & Learning Services Stuart Lewis talked through Edinburgh University’s activities in the Research Data Management arena, aided by a presentation in Japanese. Following this, we spent some time talking about Open Access to research publications and exchanging ideas about how to gain academic engagement with an institutional repository. It seems that many of the issues are the same in Japan as in the UK (expensive journal packages, lack of academic engagement with Open Access). As well as these main topics of discussion, we also spent time discussing funding streams for university libraries, roles & responsibilities of liaison librarians, library opening hours late-night service provision. We certainly found this to be an interesting meeting with very stimulating discussion – and we hope to stay in touch about many of the items we discussed. P.S. 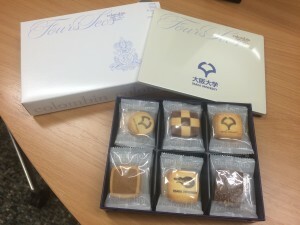 Many thanks our guests for the delicious Osaka University biscuits!! The three partners in the LOCH Project have all had busy few months, using the Summer to gear up for Open Access implementation in the new semester. 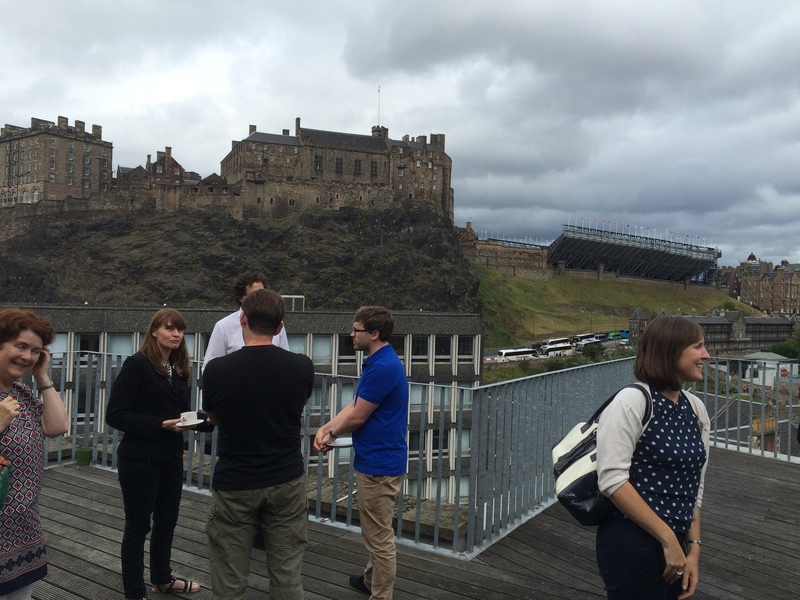 In early August, the project held a workshop in Edinburgh to talk about planning and implementation of Open Access requirements in REF 2020. Project partners presented case studies relating to activities at their universities and delegates were given the opportunity to start formulating or refining their own institutional plans. 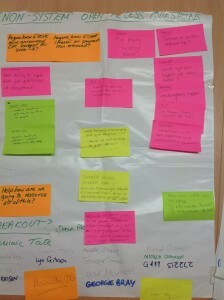 Presentations are available at http://libraryblogs.is.ed.ac.uk/loch/2015/08/06/ref-open-access-planning-workshop-5th-august/. 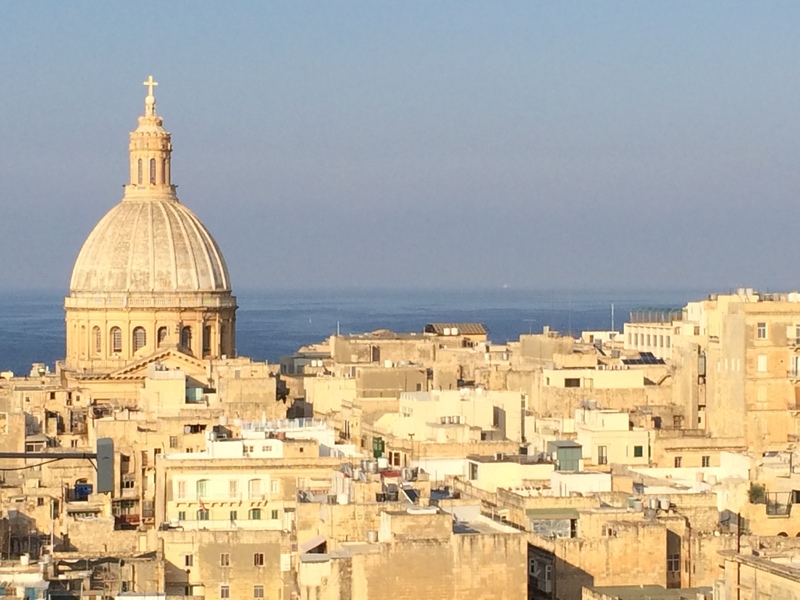 Dominic Tate attended the ELPUB 2015 conference in Valetta, Malta and talked about UK Open Access policy and the University of Edinburgh’s approach to implementing Green Open Access in light of the OA requirements for the forthcoming REF. A conference paper which briefly analyses the implications of these requirements and the presentation slides are available at https://www.era.lib.ed.ac.uk/handle/1842/10553. Colleagues at St Andrews University have published a series of reusable email templates which can be used by repository staff in a variety of circumstances to encourage academics to transition to “deposit on acceptance” (as required for REF compliance). These are licenced with CC-BY and are available at https://research-repository.st-andrews.ac.uk/handle/10023/7506. Devise, implement and maintain one steady internal policy on Open Access which provides best-fit for a range of external drivers (REF, RCUK, Wellcome, Horizon 2020 etc.). Do not change internal Open Access policy to reflect changes in the wider environment – doing so could be unsettling for researchers and undermine confidence in your Open Access services. Devise one very simple, clear message about what action researchers need to take and the support there is available to them. Robust yet flexible planning and early adoption are everything. Do not underestimate the time it takes to achieve a change of culture around publication practice. Don’t work in isolation – gain the buy-in of senior stakeholders, research administrators, library staff and academic research leads across your institution. A short workshop on Open Access implementation for PURE customers is planned to take place at the PURE UK User Group in Birmingham on Wednesday September 30th. Please contact dominic.tate@ed.ac.uk for further details of this event. Dominic Tate will be presenting at a FOSTER webinar facilitated by Jisc and ARMA on Thursday 19th This webinar will feature a series of case studies on Open Access advocacy – details are available at https://www.arma.ac.uk/events/training-and-development/online-resources/neventitem.2015-06-17.2792528938. A further Open Access planning workshop is planned for early December – this will take place in England – exact location and date to be confirmed and publicised shortly. Earlier this year we published a report “A year in the life of Open Access support: continuous improvement at University of St Andrews” which described development of our OA support service. In our case study we mentioned email templates that were being used and in our “REF-monitoring” workflows (Appendix 2. p14) and to back up our simple messages about the HEFCE OA Policy for the next REF. We have recently amended the templates, simplifying the message further to avoid any confusion over dates, and because many of our researchers now have a reasonable awareness of the policy. We continue to use them as a way of encouraging early deposit of accepted manuscripts into our Research Information System, Pure – and to thank authors who have already deposited. We have now sent out well over 200 emails, and have been getting a great response. Naturally our inbox is bursting with additional enquiries and some concerns, but in general authors are happy that they are getting guidance on what/how/when to deposit. Our deposit rate for 2015 across the University is now around 69%, with one School (where we have been working closely to develop additional support) reaching 89%. Some Schools are yet to catch on, so we continue to use other forms of communication such as regular newsletters. Our favourite response to these is “Interesting… please do come and speak at our staff council to get us up to speed” – so the advocacy work continues! LOCH Project at ELPUB 2015! 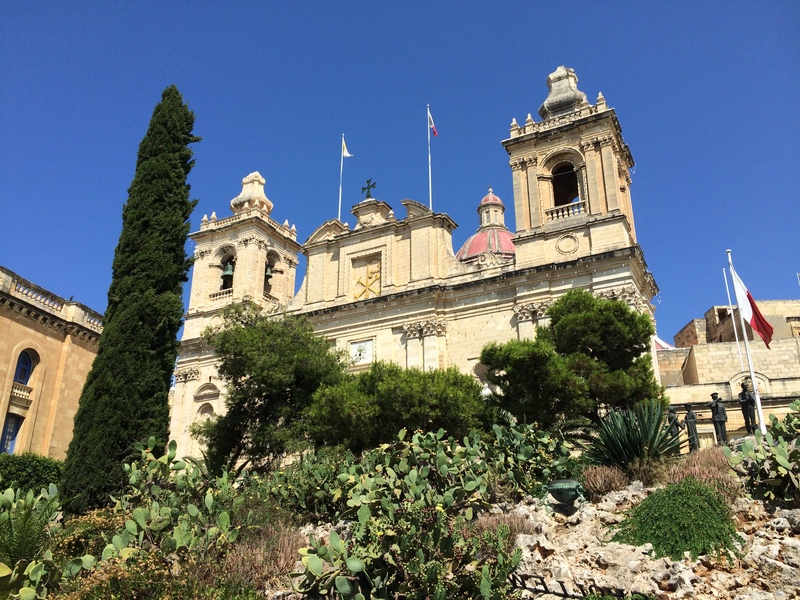 Last week I attended the 19th International Conference on Electronic Publishing (ELPUB 2015), which took place at the St James Cavalier Centre for Creativity in Valetta, Malta. The theme of this year’s conference was “Scale, Openness and Trust: New Avenues for Electronic Publishing in the Age of Infinite Collections and Citizen Science”. 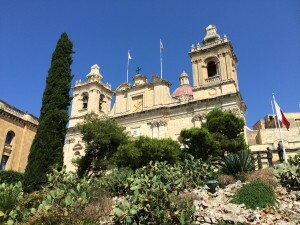 The conference attracted over 70 delegates from all over Europe – most of whom were employed in scholarly communications roles in university libraries. The convenient size of the event, combined with the specialisms of the attendees made this a really useful event for me to attend – I was able to gain quite a lot of insight into publication trends in different countries and in particular, progress with the transition towards Open Access. I think Finland might be one to watch on this front – our Finnish colleagues have ambitious plans to become 100% Open Access in the next few years! The conference featured a particularly interesting opening keynote from Gowan Dawson of the University of Leicester, who introduced the theme of citizen science by reviewing the history of this area with a particular focus on some interesting 19th century publications such as Hardwicke’s Science-Gossip. 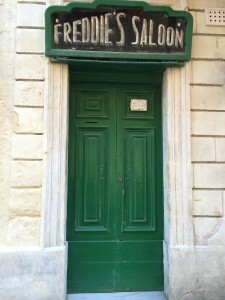 Other notable presentations included Gail Feigenbaum’s keynote on the unintended consequences of electronic publication – (which even included salary disparities between editors working with print and electronic at one publishing house) and a fabulous talk from senior staff of the Times of Malta, who discussed the impact that disruptive technologies can have on media such as newspapers. They also talked about the pressures that the likes of Facebook and Google can exert on a small press such as this, and the limited recourse available to them. My paper focused on the UK’s REF Open Access policies and how this is proving a real game-changer in the rate of adoption of OA in the UK. The full conference paper and my slides are available to download at https://www.era.lib.ed.ac.uk/handle/1842/10553 . Yesterday the LOCH Project held a workshop at Edinburgh College of Art, looking specifically at issues to do with planning for the implementation of the Open Access requirements in the next REF. This event was attended by 33 delegates from 19 universities in England, Scotland and Wales, one publisher, one systems supplier and Jisc. Understanding cultural change and how best to make this happen in your institution. The LOCH Project is pleased to announce the publication of its latest case study: A year in the life of Open Access support: continuous improvement at University of St Andrews. This case study explains the “Lean Exercise” that the Open Access and Research Publications Support Team took part in during May 2014, as well as the follow-up to this exercise and the impact it has had on the team’s day-to-day activities. The case study provides plenty of detail of the Lean method, details of process improvements undertaken at St Andrews and example documentation which is available for re-use. Today, I added a number of risks related to Open Access to the University’s Information Services Group Risk Register. The risks were around loss/reduction of funding for Open Access and non-compliance with RCUK and REF Open Access policies. The purpose of this exercise was to make sure that risks are formally documented to library management, and also to show that we have thought about mitigation, and identified individuals responsible for these risks. As mentioned in earlier posts, we have included more detailed risk registers on School implementation plans. We are now thinking about whether it would be appropriate to encourage Schools and Colleges to include similar items in their organisational documentation. We’d be interested to hear if other Universities have taken a similar approach, and if this has had any impact in raising awareness or on planning for OA implementation. Please get in touch if you’d like to discuss this more, or have anything to feed back. I realise we’ve been a bit quiet recently, so it is high time we posted an update to let you know what we have been doing over the last few months! The good news is that we now have a case study and a number of related documents which we are pleased to be able to share with you. We hope that these documents will provide some inspiration and assistance in planning and gearing up for Open Access in the next REF. Last week Janet Aucock and I attended ARMA’s Good Practice Exchange event, at which we presented St Andrews and Edinburgh Universities’ approaches to preparing for OA in the next REF. St Andrews are adopting a more central approach with the library taking ownership for all the administration, whilst here at Edinburgh, we are adopting a more decentralized approach, with more work being carried out in Schools and Colleges. We’ve made St Andrews and Edinburgh’s slides available, as well as our planning checklists. Anna Krzak, Edinburgh’s Open Access Administrator in CMVM has kindly put together a case study looking at the specifics of implementing the REF OA requirements in the context of medical sciences. Hopefully this will be of use to other Universities. If you have any comments about this then please contact either anna.krzak@ed.ac.uk or dominic.tate@ed.ac.uk and we would gladly discuss this work further. Here at Edinburgh, we are starting to contact academics about the new requirements, and you might be interested to this exemplar draft email, which is intended to be sent to all staff in the College of Medicine. This second example email was sent to all staff in the School of Mathematics. 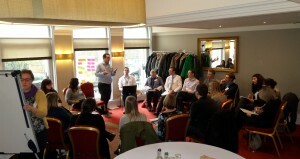 The University of Edinburgh is in the process of agreeing implementation plans within many of its Schools to agree locally how the new OA requirements will apply, and to details the processes needed to make this happen. We’re delighted to include here an example School Implementation Plan, drafted by Jacq McMahon (Research Officer in the College of Humanities & Social Sciences). This College is also starting to think about what resources will need to be put in place to manage any additional workload. At present the College is considering employing new Open Access Facilitators to work in Schools and in co-ordination with the Library’s Scholarly Communications Team. A (draft) job description is also available. Here at the University of Edinburgh, we finally getting to grips with the implementation of the REF Open Access Requirements. The Scholarly Communications Team has undertaken a wealth of outreach activities over recent months and has now been to visit over two thirds of the University’s 22 Schools to talk about OA and to start to make plans for how the REF requirements will work in practice. As this is a large, Russell Group University, we are taking a more devolved approach to the implementation of the policy, with responsibility for the policy resting at a local level within Schools and Colleges. Each School is working with the Scholarly Communications Team to formulate a plan of action that will work for them – based on a number of variable factors, including publishing patterns, staffing levels and the nature of the publishing process in that particular discipline. Firstly, here are draft copies of a Responsibility Matrix and explanatory notes which have been drafted for discussion in Medicine and Veterinary Medicine. These documents was produced to make it easier to identify and agree responsibilities in this particular College, which has a complex organisational structure made up of various Research Centres and Institutes. It is important to make responsibilities clear as part of the planning process and we are hoping that this document may help within this part of the organisation. Many thanks to Anna Krzak for being prepared to share this document. I’m pleased to be able to share with you a draft implementation plan for one of our Schools, as well as an edited copy of the same paper which can be used at a School Research Committee to illustrate the problem and planned solution. This plan reflects the University of Edinburgh’s use of PURE, but the principles could be applied within any institution. This School has a relatively well-resourced administration function with its own Knowledge Management team, which will be heaviliy involved in the implementation of the REF requirements. Many thanks to Tamise Totterdell for being prepared to share this documentation with us. If you have any questions about, or comments on either of these documents then we’d be delighted to hear them – please get in touch! As part of the work to embed good Open Access Policy within the institution, three awareness sessions were held within Schools with research staff. Two of those sessions were led by Research Administration staff and one by the Library, reflecting the spread of open access support within the institution. At Heriot-Watt University, RCUK OA administration is within the Schools, with over-all OA coordination by the Library in close cooperation with the research office (Research and Knowledge Exchange Services). So good coordination of effort and information is essential, and we are working to consistently achieve this objective. The message at the sessions led by research administrative staff for academic staff was kept very simple, using the opportunity to update staff on RCUK Open Access, research data requirements, ResearchFish and the HEFCE Open Access Policy. Representatives from the Library and Research Office were present to provide extra information if needed. As an outcome of those sessions, it is clear that academic staff see open access is one stage in the administration of their research – from the grant application though to final reporting and publication, with research somewhere in the middle. Although attendance at the sessions was about 10% of the total academic staff, the slides were circulated afterwards, and as a result of those sessions we saw a direct increase in the number of full-text uploads to Pure. In addition, an initial good practice session was held with School research administration staff, research policy managers and library staff, with the aim of refining current internal open access policies and planning for future processes. We used as a guide the lean process followed by St Andrews. This led to two refinements in processes – one to the spreadsheet and process used to record to details of APCs and green open access papers and secondly in the creation of a process document to cover “cradle to grave” OA processes. Being able to see other institutions spreadsheet and compare and contract was extremely useful. The OA process document was initiated in consultation with senior academic staff. It is a concise high-level document (necessarily a work in progress) but provides a reference point for all parties involved in OA administration in the university. It is intended to create a graphical representation of the process. Reaching those Schools less involved in the OA process, due to lack of RCUK funding, and planning the questionnaire developed by Edinburgh as an initial “in”. Development of publicity materials – posters were identified as the most useful method. As part of the dissemination process for the project, we gave a presentation at the University Science and Technology Librarians Group, on 18th November, at Aston University. At the University of Edinburgh, we have been working on getting the message out about the OA requirements for the next REF. Almost as soon as the requirements were released by HEFCE, the Scholarly Communications Officer Theo Andrew put a simple page together on the library website to provide information to academics. We felt that it would be useful to simplify the requirements and to produce a “micro-site” which would provide information to academics, to complement our portfolio of outreach and advocacy activities. Scholarly Communications Officer Eugen Stoica has been working on a design based on a template in WordPress. This beta site is live, though it has not been widely promoted to its target market of academics as we are awaiting for it to be professionally re-built in the University’s new CMS. We are expecting a formal launch in the New Year. However, in the meantime you can see our rough designs and suggested texts at www.ed.ac.uk/open-access-ref (the URL will remain constant, but a visually improved site is in development). The design elements will remain the same, and we have printed some business cards to provide people with a reminder of the URL. We are licencing the website design, content and the design of associated materials (such as the business cards) using CC-BY, with the intention that other Universities can build on and develop our modest work. Just wanted to share a bit of re-use and sharing activity with you. As a result of our ‘mini Pathfinder’ activities (working closely with 3 Schools) we were prompted to produce a set of minimum requirements to help the deposit process. Effectively the Schools said, ‘tell us the least we need to do to get this HEFCE thing working, and give us a checklist we can work to’! So, we adapted the great diagram and wording that Theo and Eugen produced, and created a checklist that fits on a single page. We took this to a School presentation on HEFCE OA policy yesterday as an A5 leaflet, which was snapped up as people left. They had started the session with complaints about how hard all this was going to be, but seemed to be persuaded by the simplicity of this approach combined with Library support to check things and add more metadata later. By the end of the afternoon we had 17 accepted manuscripts deposited by academics from that one session. Of course we may now be regretting this approach as it proves to be pretty resource intensive for the OA support team to work on such basic records, but hopefully should provide some good evidence of what works in terms of basic compliance. We’re delighted to announce that the University of St Andrews has published this case study on the challenges and pain points regarding Open Access transactions and processes that arose out of a presentation made at the UKSG workshop in May this year. Janet Aucock updated the article to include initial plans for St Andrews’ contribution to the LOCH project and also to include a brief summary of the Lean exercise they undertook earlier this year. The team at St Andrews is now underway with a series of mini Pathfinder projects with academic schools and is getting some interesting feedback from the different disciplines. We’ll be sharing this in future LOCH reports. UKSG October webinar: The University Library as publisher. Can you? Should you? This webinar was held on Wednesday 29 October 2014 and was jointly presented by colleagues from the Universities of St Andrews and Edinburgh. The idea of the webinar was to understand how open access publishing initiatives can be delivered for academic staff and for students and to give some practical advice on how institutions might want to consider setting up a service. Janet Aucock of St Andrews opened the webinar and introduced some of the main themes. Jackie Proven of St Andrews and Angela Laurins of Edinburgh gave in depth case studies of their journal hosting services and covered all aspects of setup, staffing, costing and sustainability. Both institutions have extensive experience in using OJS (Open Journals System) for journal publishing and this was the main topic for the session. It was clear from the questions that came in before the webinar that participants were also very interested in open access publishing for other material, especially monographs. So this looks like a topic for further discussion and exploration. Further key themes were trying to decide who is the publisher. Is it the journal editors, the academic department or is it the Library? Both Edinburgh and St Andrews offer journal hosting services and do not “publish” but it was felt that distinctions about publishing roles are becoming blurred anyway and that this sort of publishing is often a collaboration of people. Another major theme was how a journal hosting service can give great opportunities for journal editors to learn about the publication process and gain valuable experience. Services are not so much about supplanting existing established journals but giving new journals and their creators the opportunity to get involved with ways of exchanging their ideas and learning new skills. Journal hosting services also work well when they are part of wider open access services because they can demonstrate open access in action. The webinar also picked up on themes first posted to the LOCH blog in August 2014 when the “University Library as publisher” was a themed workshop at this year’s Repository Fringe. We were particularly pleased to be able to deliver this webinar knowing that both St Andrews and Edinburgh are part of the Pathfinder projects and are collaborating together on the LOCH project with Heriot Watt. Collaboration and best practice are important themes in the LOCH project “which seeks to provide case studies of evidence of best practice in relation to OA workflows”. Models for good practice for open access compliance are built on author awareness about open access issues. Both St Andrews and Edinburgh can see real value in their Journal Hosting Services from the perspective of developing open access awareness among their journal editors and submitting authors. This theme came through very strongly in the webinar and we believe that our services will continue to develop these skills among our users, especially undergraduates and postgraduates who will become the next generation of academic authors and who will be much more familiar with open access publishing. Over the last few weeks. 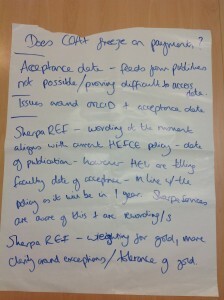 the University of Edinburgh has seen a whirlwind of activity around the Open Access requirements for REF. The Library’s Scholarly Communications Team attended an HSS College Research Committee, which has resulted in appointments to speak at School or subject area departmental meetings to inform academics of the latest requirements and how they will be implemented. Edinburgh also hosted a meeting of the PURE Repositories Working Group, which is working to finalise the specification for PURE, to build a robust system for the management of the OA requirements in the run-up to the next REF. I have been starting to think about planning for the implementation of the requirements and have been working with a variety of stakeholders across the University to decide how best to roll out the the requirements and get the academic buy-in and administrative support needed to get to 100% compliance. I’m writing a top-level plan for the University which will outline our overall approach to managing this as a project. In addition, we will visit every School in each of the three Colleges and run through a questionnaire to get a better picture of how things work there. We will use the results of this questionnaire to write up a brief implementation plan for each School, with agreed workflows depending on their needs. These plans will be agreed between the School (or research group, as may be) and the Scholarly Communications Team. We will include milestones and measures for testing performance, which we can use to assess progress over the coming year. Questionnaire text included below for reference. I’d be interested in any feedback on this approach, so please contact me at dominic.tate@ed.ac.uk. Please list all the research centres associated with your School. In particular, we are interested in centres or groups which are affiliated with your School but which may not always be represented at meetings or participate in School activities. 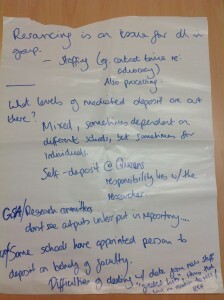 Who has overall responsibility for research in your School? How are decisions about research policy made in your School? Does your School have a designated Open Access Champion? Please give his/her name and job title. Which administrative staff are already working with PURE and/or Open Access? Please include names, job titles and particulars of working arrangements (e.g. If part-time, what days do they work? Are they on temporary contracts? Do they work exclusively with PURE/OA or is this part of another role. How many hours are allocated to this work? What channels are used to communicate important messages in your School? Please think about different formats. Who messages must come from in order to get attention? 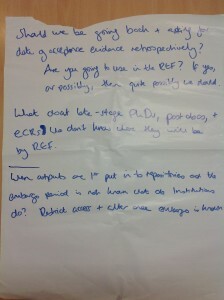 At which meetings are the REF Open Access Requirements likely to be discussed? When and how often do these meetings take place? Please provide details of any scheduled forthcoming meetings. Do you have any thoughts on how best to convey the message about Open Access in the REF to academic colleagues in your School? Please describe how you think academics in your School interact with PURE. Do you think academics use the system much themselves? Is it more likely to be administrative staff who use PURE on behalf of academics? Does this differ for different groups (e.g. early-career researchers, more senior staff)? How do think staff in your School feel about PURE? Do they like it? Do they have problems using it? Do they see benefits in using the system? What training will be required for administrative staff in your School? Do they need extra training on using PURE, Open Access, policy details? Will you require additional training for temporary or agency staff? 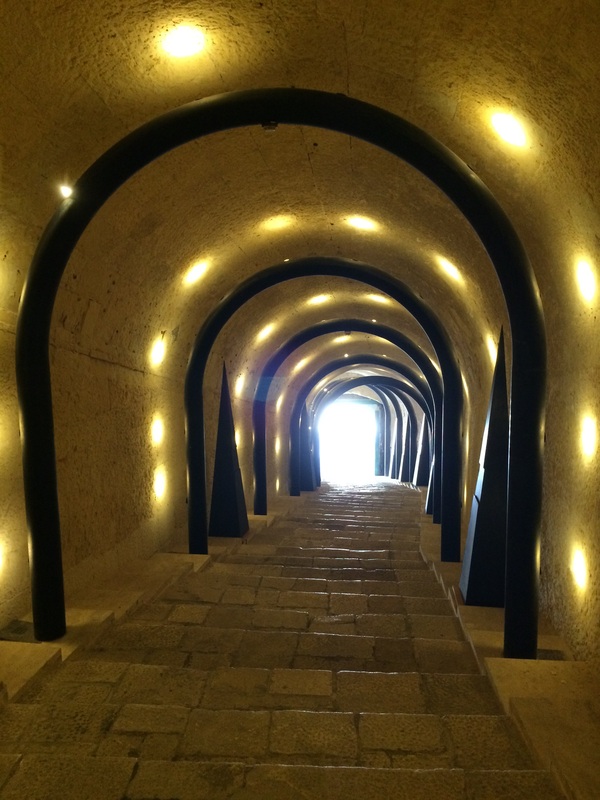 Is high staff turnover likely? What training will be required for academic staff in your School? Do they need extra training on using PURE, Open Access, policy details, versioning? Please give as much detail as possible. How do you anticipate measuring performance against Open Access requirements in your School? What information do you need from the Scholarly Communications Team? What milestones are targets would you like to see set for Open Access in your School? Implementation of the Open Access Requirements for REF requires academics to engage with PURE (or a designated proxy) each time a journal article or conference proceeding is accepted for publication. For most researchers, this represents a change in their normal procedures.How do you think we can best achieve this change in your School? At this stage, do you have any early ideas as to how the deposit, checking and validation workflow is likely to work in your School? 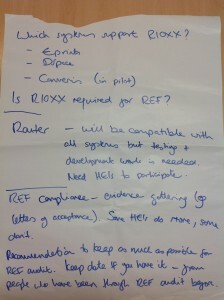 Do you have any concerns about the implementation of the REF Open Access requirements in your School? Do you have any ideas as to how to achieve successful implementation of the REF Open Access requirements which are not detailed elsewhere? Do you have any further comments for the Scholarly Communications Team? Firstly, it is clear that we need a detailed plan. I’m happy to start writing this up, but it will need plenty of input from other stakeholders within the University. The plan will need to identify a number of milestones and identify the pathway to achieving our goal of 100% of research publications being eligible for inclusion in the next REF. We need to think of this whole exercise as a project deliver it as such. We need to plan the work and then work the plan. We will need to think carefully about the support needed to deliver the implementation of these requirements, and what the implications will be for staffing. We know from our experience with the University of Edinburgh’s Open Access Implementation Project that providing adequate administrative support (even at a junior level) can make a world of difference to the number of research publications added to a repository. Marketing will be key. We are currently working on a design for a website which is aimed at delivering a simple message to academics regarding the new requirements and what they will need to do to ensure their work is eligible for inclusion in the REF. We plan to highlight that the task is an easy one (upload takes a couple of minutes) but that it is essential to make the upload at the right time and not put it off until later. Once the design is finalised, we are considering a campaign to send postcards all academics detailing the new policy and directing them to the new website. We hope to licence the text and design as CC-BY as part of the LOCH project to enable other universities to replicate it. The Scholarly Communications Team is in the process of planning an advocacy campaign for the next two semesters and will aim to contact all Schools over the course of this academic year. We will write more about our experiences as these meetings take place. The end of September is rapidly approaching and things are moving forward quickly with the LOCH Project. All three partners have been thinking about workflows and are starting to make plans about how to handle the Open Access requirements for REF in each institution. September has been a busy month for all the project partners. On Friday 19th September, Jackie Proven and I attended the a Jisc Monitor workshop in London, aimed at supporting the development of Jisc Monitor into something that will help to support Open Access processes in HEIs across the UK. On September 22nd and 23rd, Janet Aucock, Jackie Proven and Linda Kerr and I attended the Pure UK User Group which was hosted at the University of Edinburgh. LOCH Project partners have all been influential in the development of a new Open Access specification for Pure, which will enable customers to better manage OA compliance and reporting for the next REF, with the side-effect of improving compliance for RCUK and Wellcome Trust requirements too. The specification is ready to be agreed, pending the disclosure of the final metadata and audit requirements by HEFCE. A final face-to-face meeting is being planned for the second half of October. All being well, the specification will be passed to Elsevier for development by the end of October, and the new functionality will be released in June 2015. As we move into October, partners are hoping to publish initial baseline reports and to finalise the functional specification for Pure. The Scholarly Communications Team at Edinburgh University Library have just submitted their end-of-year-one report to RCUK. 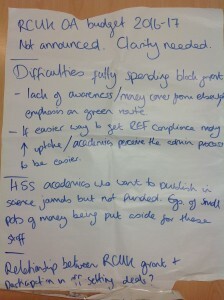 This details how “compliant” we think we are with RCUK’s Open Access policy. We know that we have far to go, and that there is still much to do, but our current Open Access rates for RCUK-funded journal articles and conference proceedings is running at 64%. There *are* a number of caveats to that figure, but having looked at a range of data samples and reports we feel that it is a representative figure that we are happy to stand by. So, that puts us ahead of the year 1 target of a minimum of 45% compliance, but there is much more to do over the course of year 2! Firstly, we need to see this rate increase further, and we need to ensure that all the details of the policy are being adhered to in every single case – (compliance with data requirements, correct acknowledgement of funder, correct CC-BY licence etc). Perhaps our biggest challenge over the next year is learning from our relative success here and stepping it up to cover ALL journal articles and conference proceedings in anticipation of the new requirements for REF. This is going to be a major challenge, but one we are ready to get stuck in to! Well done to the Scholarly Communications Team and all the Publications Assistants who have helped contribute to this success. Our full report is available at https://www.era.lib.ed.ac.uk/handle/1842/9386. 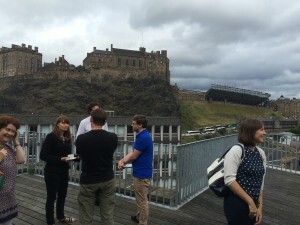 The Repository Fringe, an event which has become renowned for its informal, ‘un-conference’ approach and its friendly atmosphere, was held at the University of Edinburgh 30th & 31st July. This year’s event welcomed a record number of 150 attendees and saw over 20 speakers give their time to prepare and deliver innovative presentations and workshops covering various aspects of Open Access repository development and management. On the second day, Angela Laurins and Dominic Tate led a workshop to explore the idea of Library as publisher. We looked at our experience of managing the University of Edinburgh’s Journal Hosting Service which uses the open-source OJS (Open Journals System) software to host journals on behalf of students and researchers. Angela provided some background information to the service, highlighting the key milestones and challenges which have shaped the (free) service we offer at Edinburgh. She asked the audience if the Library has evolved, albeit unintentionally, yet, perhaps inevitably, from its role as distributor to become a publisher? What do you think: are we a publisher or a distributor? Should we continue as we are? Should we start to charge for the service? Should we offer the service to other universities? 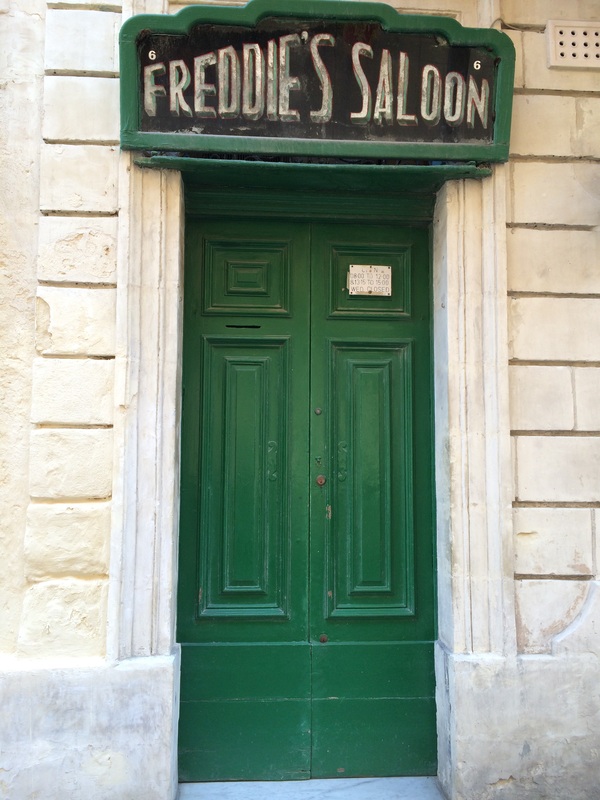 Should we formalise our role as a publisher? There is no question that we have the skills in the Library to provide the additional publisher-related services, the question we wanted to ask the workshop was, just because we can, does that mean we should? So next, it was over to the audience to break into groups and conduct a SWOT Analysis (strengths, weaknesses, opportunities & threats) on the concept of the University Library as a Publisher. Do we understand the needs of our colleagues that well? Scalability: can the model be sustained? Would adopting an APC pose a threat to EUP? Increased responsibility to host this forever. The University brand was considered to be both a strength and a weakness and confusion with the University Press as a weakness and a threat although there is also opportunity there to share expertise and work together to fulfil the University’s OA aspirations. Scalability was an issue raised, as was the increased responsibility and liability of the Library if it were to formally adopt the role of publisher. Unfortunately, we ran out of time. However, the SWOT analysis started the beginnings of a conversation that will continue both at the University of Edinburgh but also across other UK campuses as Libraries continue to expand their role in OA publishing. 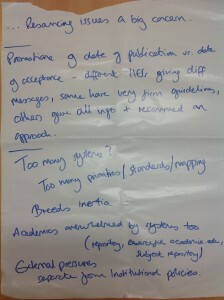 At the end of the workshop we asked, ‘Based on the evidence, should University Libraries be publishers? The overwhelming majority voted ‘Yes’. Votes counted, the result was: Yes 14, No 2 and Undecided 1. Lessons in Open Access Compliance for Higher Education (LOCH) is a collaborative project looking at best practice in the management of Open Access within research-led universities. The project is shared between the University of Edinburgh, Heriot-Watt University and the University of St Andrews, and has been funded by Jisc as part of its Open Access Good Practice programme. The LOCH Project will provide a series of re-usable, Open Access resources which will be of use to practitioners working with Open Access in Higher Education Institutions across the UK over the next few years. These resources will outline the rich experiences of the three project partners of implementing systems to enable, verify and report on Open Access at each institution. The resources (case studies, workshops, webinars, work-flows etc.) support Jisc’s commitment to making compliance with Open Access requirements as easy as possible for researchers and as efficient as possible for all universities. The University of Edinburgh, Heriot-Watt University and St Andrews University have long been committed to Open Access and already have a culture of sharing good practice between institutions. The three universities use the same CRIS system (PURE) and were joint submission partners in REF2014. The Universities vary in size and speciality but are all research led, and are already gearing up for reporting on Open Access activities for RCUK, as well as preparing for the new requirements for the post-2014 REF. The LOCH Project enables the three partners to formalise existing collaborations and a culture of sharing information in a way which will benefit the wider Higher Education community in the UK.